One of the fundamentals of tenkara angling is the one-fly concept. Most Japanese tenkara adherents use just one pattern (although the size or color may vary), usually in the sakasa kebari style. I would think that most of us who have adopted the tenkara technique in this country are probably still using our familiar Western fly patterns that have served us so well. That being said, the simplicity of needing only one fly in your flybox, the fly’s utility multiplied by manipulating it in a variety of ways, is very appealing. Even prior to discovering tenkara, my fly selection had gradually diminished to a reliable few, in large measure because I fish my homewater, Spring Creek, almost exclusively. 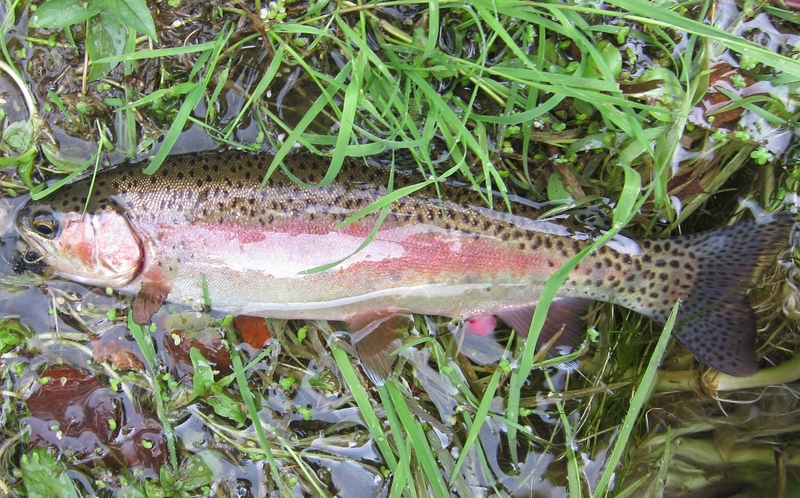 If you fish the same water a lot, you soon discover which fly or flies work most consistently on that stream. 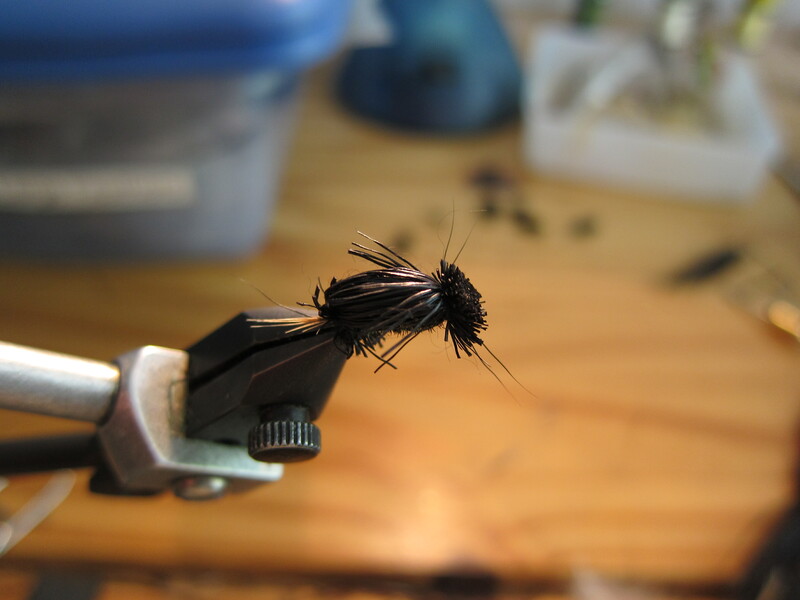 For me, fishing Spring Creek, my favorite dry flies became the black deer hair beetle and a parachute light Cahill-like pattern, my fishing the beetle about 80% of the time. For nymphing I use almost exclusively a beadhead flashback pheasant tail. There are several things I like about the beetle. 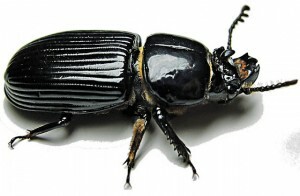 With a little floatant, the beetle will float like a cork. Tied on a size 14 dry fly hook with a generous amount of deer hair, it’s a piece of faux protein that the trout have a hard time resisting. When cast right up against the bank, a boulder, root wad, or other structure, the take is often immediate and violent. When cast above a holding trout, I can almost imagine that I can see the fish trembling with anticipation of the large meal coming his way. Many times I’ve watched trout miss the first strike and follow the beetle downstream, perhaps slashing at it a second or third time before successfully inhaling it. What fun! Of course, every upside has a downside. The beetle is difficult to see on the water sometimes, especially in shadow, and one needs to develop a sixth sense for where the fly is at a given moment. For my wife I tie the beetle with a small yellow-foam “backpack” to make it more visible. Also, the beetle can be a somewhat fragile fly, but I’m willing to accept that because it’s so effective, and it’s easy to tie. If you are a fly tier, your choice of fly will naturally also be informed by what you enjoy tying or feel that you are good at tying. The one-fly concept, then, goes a long way to settling the debate of presentation vs pattern vs color vs size, especially on a relatively infertile freestone stream, where trout do not have the luxury of large insect hatches. They cannot afford to wait for the “right” fly to come along. However, even on Spring Creek, where a multitude of mayfly and caddis hatches occur, the beetle proves its mettle. If the trout are “looking up,” the beetle will almost always work. Also, in fast, shallow riffles trout will “rocket up” from the stream bottom to inhale the fly. Just today I tied a sakasa kebari and plan to test it on my next outing. So, stay tuned. Until then…. My advice? Try the beetle kebari! P.S. What is your choice for a tenkara one-fly? Some time back I ran into you and your wife at Montauk and you told me about your Beetle Kabari. I tied a few up and finally had a chance to use them last week in the catch and release area. I caught several fish and my dad caught his first Tenkara fish and his first top water fish on the Beetle. Thanks for the advice. Rick, glad it helped. Thanks for the feedback.